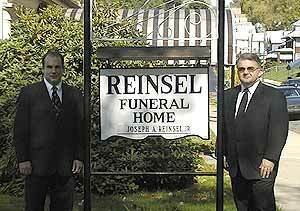 The Reinsel Funeral Home & Crematory is a family owned and operated funeral business that has served the Oil City area since 1924. 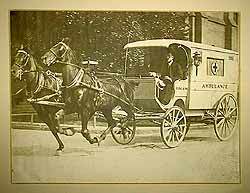 In 1904, Thomas (TL) Reinsel and his father Daniel Aaron Reinsel both of Clarion County opened a livery stable, horse drawn ambulance business, and a undertaking service in Farrell, PA. They later opened a branch office to their pre-35 license in Oil City in 1924 after being invited to the area by several local residents. At this time they hired a younger member of the family Joseph W. Reinsel to assist them in running the Oil City location. On Dec. 2, 1926 Joseph W. Reinsel graduated from the Eckels School of Embalming in Philadelphia and returned with his family to make Oil City their home. 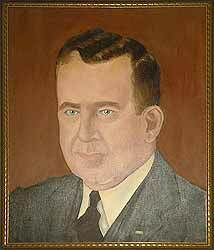 In 1927 he became sole owner of the Reinsel Funeral Home & Crematory at 122 E. 1st St. in Oil City. They would later move to 13 Grove Ave., remaining there until 1945 when he moved to the present address at 116 Bissell Ave.
Joseph A. Reinsel Sr. purchased the business from his father in 1960, and then in 1984 sold it to his son, Joseph A. Reinsel Jr. In 2013, Michael J. Reinsel purchased the business from his father, who is still an active part of the firm. Michael is a licensed funeral director (Oct. 2001), becoming the fifth generation in funeral service. Michael's brother recently joined the firm and is employed as a funeral director.